When it comes to France, my joy is sparked not by the grand avenues of Paris, dainty treats from the patisserie, or high fashion shopping, but from the rough and ready parts – bold flavours, cold seaside towns, grimy newsagents, supermarket shelves and farmers markets. My favourite French towns and cities will never make it into Vogue, but they provide the kind of experience I crave – real life, real people, real food. 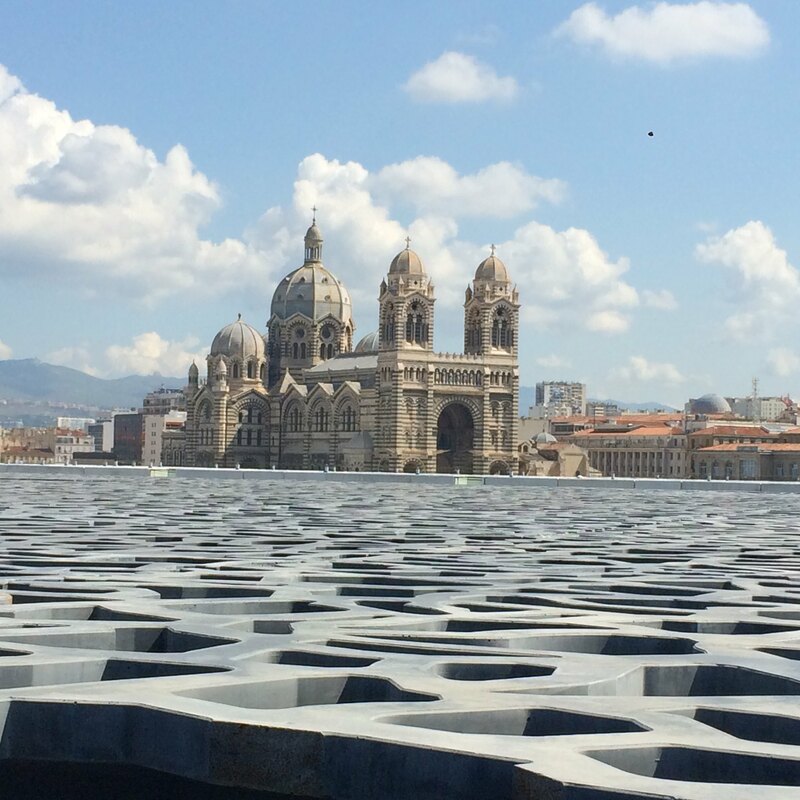 A few years ago, my husband and I visited Marseille, completely unaware of its seedy reputation, and discovered a beautiful, underappreciated gem of a city, complete with a rich tradition of gorgeous Provencial food and culture that I fell in love with. 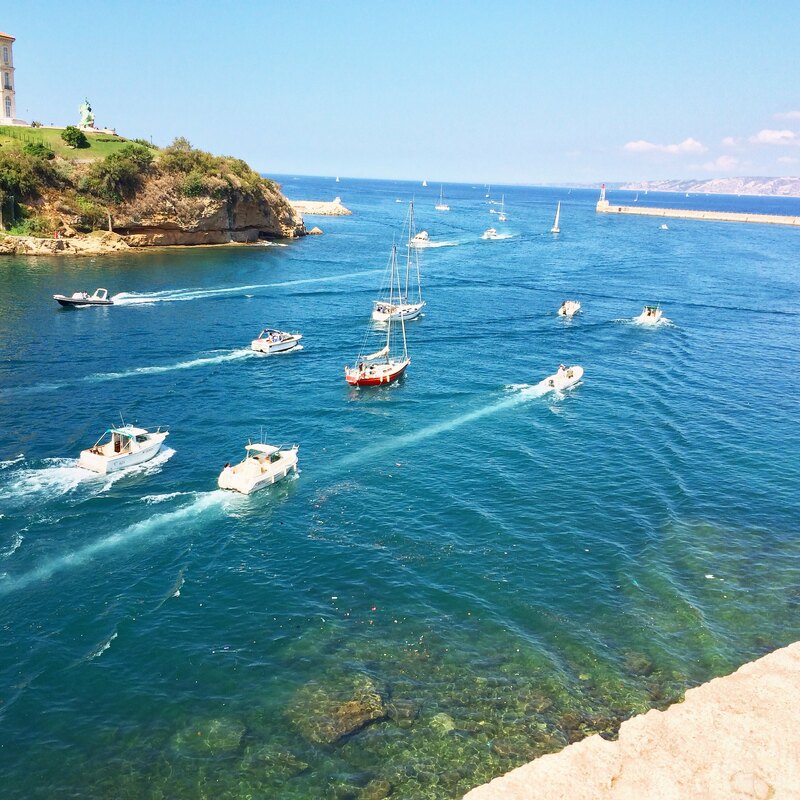 I love Marseille a great deal and I can’t wait to return, so I thought I’d whet my appetite by listing my top treats for the city – you should definitely make sure you tick off some of these if you visit. 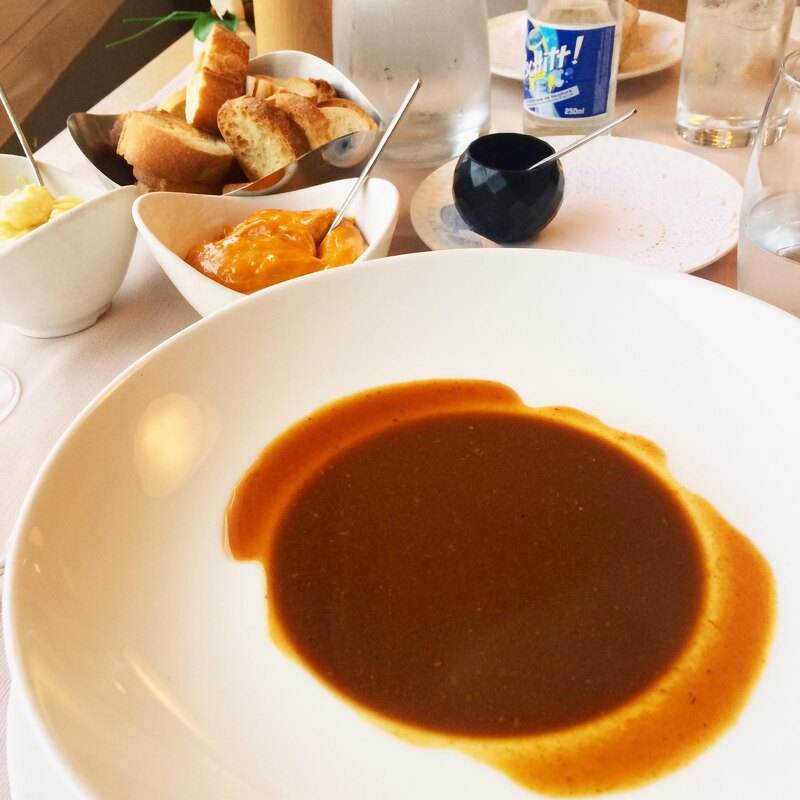 My all-time absolute favourite meal ever is still the Bouillabaisse I had at Chez Fonfon, so if you only eat one thing, make it that! Ever had a meal that’s so good, you think about it for years afterwards? That’s exactly what happened when we visited Chez FonFon for our wedding anniversary in 2014. Bouillabaisse is one of Marseille’s greatest culinary traditions, and, like many great French recipes, began as a peasant meal which quickly developed into a classical dish with a host of rules and regulations about how to cook it, and what should be included – which can be the source of heated debate! 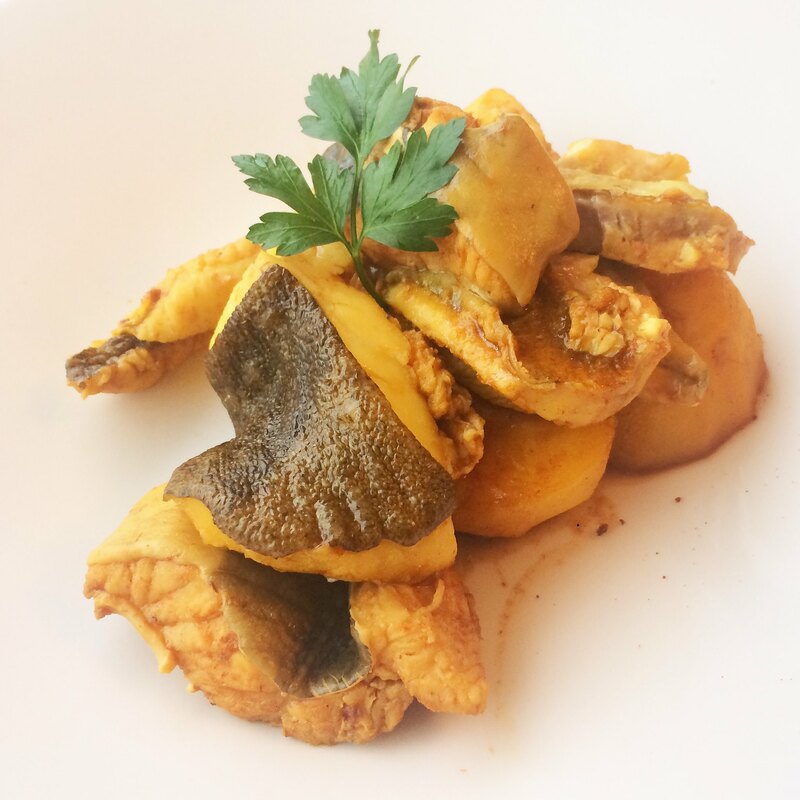 The dish is traditionally made with bony rockfish native to the Marseille coastline, which means it’s as local as they come – and also means it’s difficult to replicate precisely elsewhere. These fish are sliced, bones still in, and browned with olive oil, onions, garlic, and tomatoes. Then the filleted fish is added, topped with boiling water, and fennel, saffron, bouquet garni and seasoning is added. For what it’s worth, I’ve never had Bouillabaisse as good as this, and frankly, as I’m the only person who eats fish in my house, I’m not likely to try to make it myself any time soon. At FonFon, as in many Marseille restaurants, they serve the fish separate to the broth, and they’re more than happy to ladle out multiple bowls of it if you’d like (which I very much did!). The dish is served with a rouille, which is a spicy mayonnaise with garlic, cayenne pepper and saffron, and aioli, which you can slather onto croutons. The rich, tomatoey broth, together with the silky, flavoursome fish, and the crunch of the croutons with their heavenly toppings of wobbly, slick, spicy mayonnaise – it’s a match made in heaven! 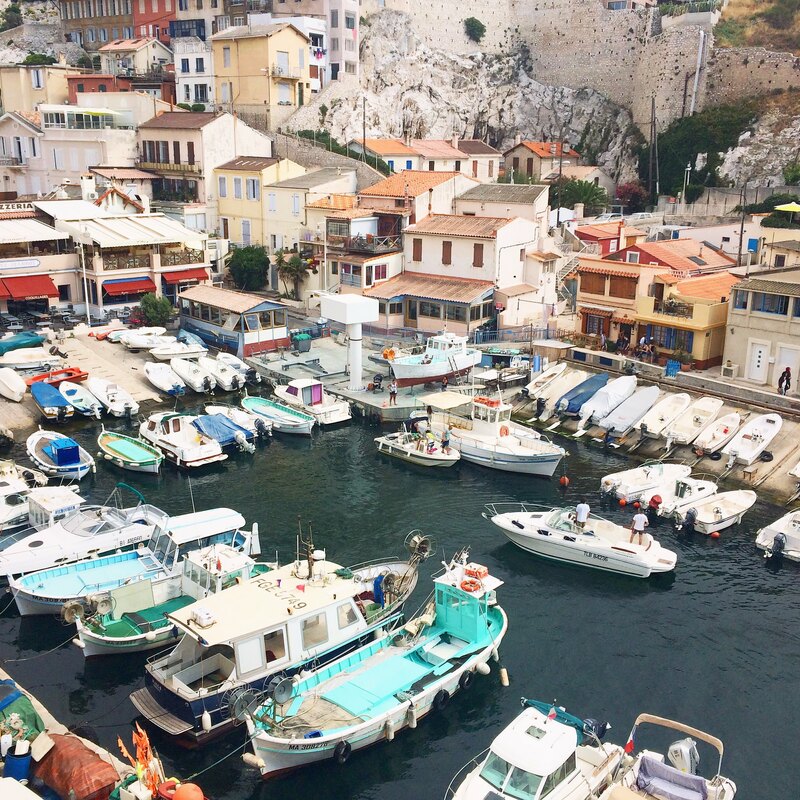 You probably wouldn’t expect to find North African cuisine in France, but Marseille is a real melting pot of culinary traditions, and is home to more than just classical French dishes like Bouillabaisse. I’ll talk about Italian influences later, but for now, let’s look at the Tunisian restaurant, La Kahena, which is very close to the Vieux-Port (Old Port). With a beautifully decorated interior and authentic Tunisian cuisine, this is a must-visit if you want to get a true taste of the breadth of Marseille culinary culture. The menu isn’t large, but I recommend the couscous complet, which consists of a spicy bowl of broth accompanying a huge bowl of stewed vegetables and couscous, topped with a variety of meat, including a lamb cutlet and Merguez sausage. The Merguez sausage is another truly great addition to French cuisine by way of North Africa – minced lamb or beef mixed with cumin, harissa and other seasonings like garlic, chilli, fennel and sumac. It’s very piquant and spicy, and goes perfectly with this dish! It feels strange to recommend moules mariniere considering you can eat this in practically any coastal city or town in France (and actually, there are plenty of places to enjoy it here in the UK, too), but there’s something special about enjoying a big bowl of mussels right at the water’s edge. For extra points grab a table in a restaurant at the Vieux-Port, and eat watching the sun set. Moules are hard to get wrong in a seaside town. Regional liqueurs are one of my favourite things about French foodie culture – I love the fact that each region specialises in a different kind of tipple, and creates a whole mythos and tradition about them. We spend most of our time when we’re in France in Normandy, where le trou Normand, or ‘Norman hole’ means a shot of brandy (usually calvados) in the middle of a large meal to get your appetite working again (creating a ‘hole’ in your stomach for more food!). In the south of France, though, it’s pastis which is king – this oily, ainseedy drink is consumed with chilled water, which turns the clear liqueur into a milky yellow colour. Marseille is one of the hotspots for pastis, where it also has the nickname pastaga, and you can also find an entire shop dedicated to it, called La Maison Du Pastis. 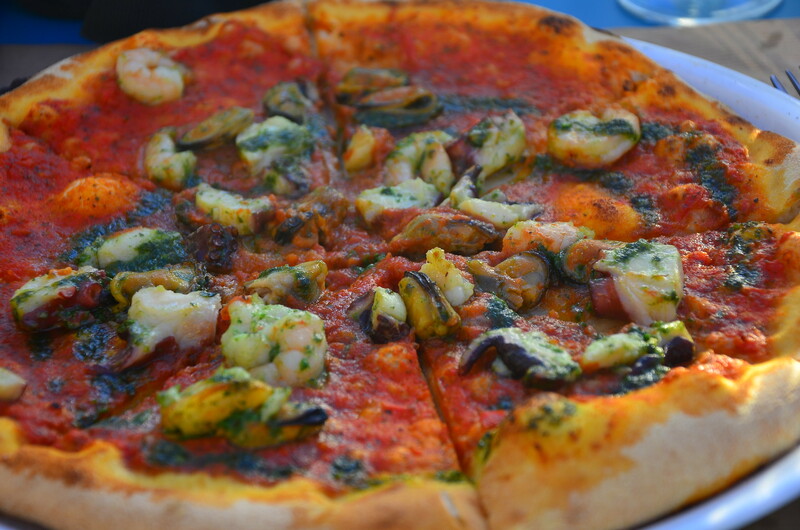 Pizza may be a strange recommendation for a French city, but Marseille has a rich tradition of pizzerias thanks to a large influx of Italian immigrants – in fact, as many as 40% of the inhabitants of Marseille were from Italy in the early 20th century. The most famous of these pizzerias is Chez Etienne. Infamous may be a better word, in fact, because this eatery was notorious for not only the quality of its food, but for the temper of its chef, who would, rather eccentrically, only tell you how much the meal was once he’d had a look at you. Unfortunately, when we visited Marseille, Chez Etienne was closed, so we went to Chez Sauveur instead – which is very near to Maison Empereur, a fantastic kitchen shop which also stocks authentic Marseille soap (harder to source than you would think, as many of the soaps on sale are made cheaply elsewhere). Chez Sauveur is actually hailed as one of the best pizza places in Marseille at the moment, and our pizzas were gloriously jam-packed with punchy flavours. 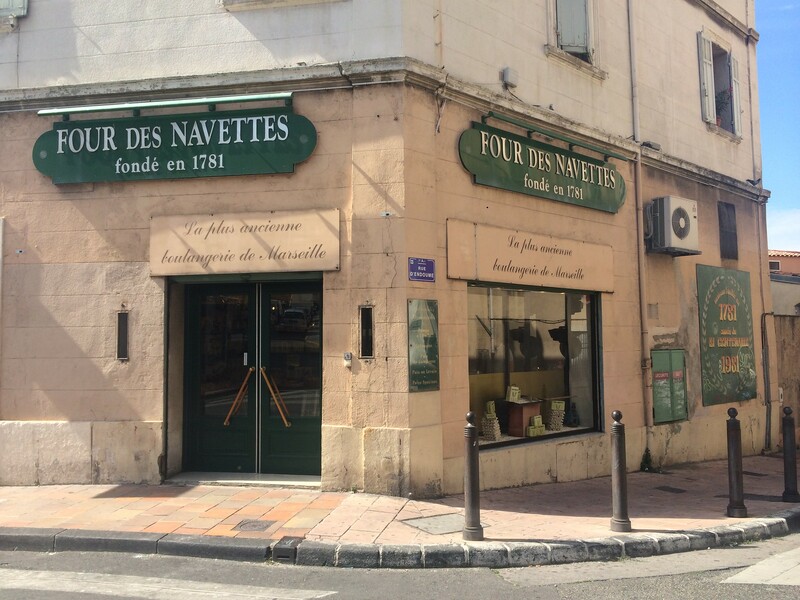 Like pastis, I view navette de Marseille as an interesting culinary quirk you should try in order to pay respect to the the city’s history, rather than something I really enjoyed eating. These little biscuity cakes are shaped like oval boats, and are flavoured with orange water. Crumbly and dry, you can purchase these at Four des Navettes, the oldest bakery in the city, which is opposite the abbey (also a good place to visit!). Like many of these dishes, there’s a rich history behind the navettes – some say that they’re shaped like boats to honour the arrival of a statue of Our Lady of the New Fire, which washed up on the shores in the 13th century and became a symbol of protection. 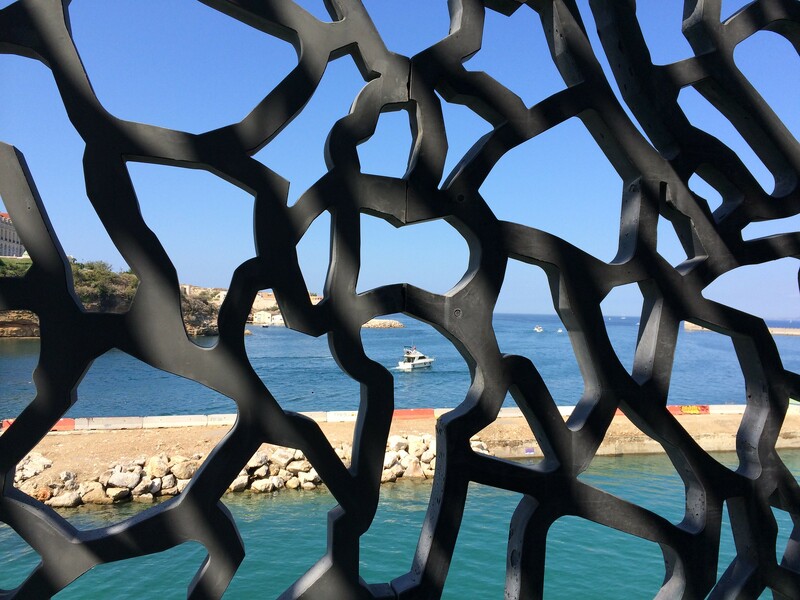 Others say it represents Isis’ boat, which brought The Three Marys (the Virgin Mary, Salome and Magdalene) to the coast of Provence. The true meaning is lost to time, but the biscuits live on – and it’s said that there have only ever been three guardians of the recipe in the two centuries the navettes have been made in Marseille. 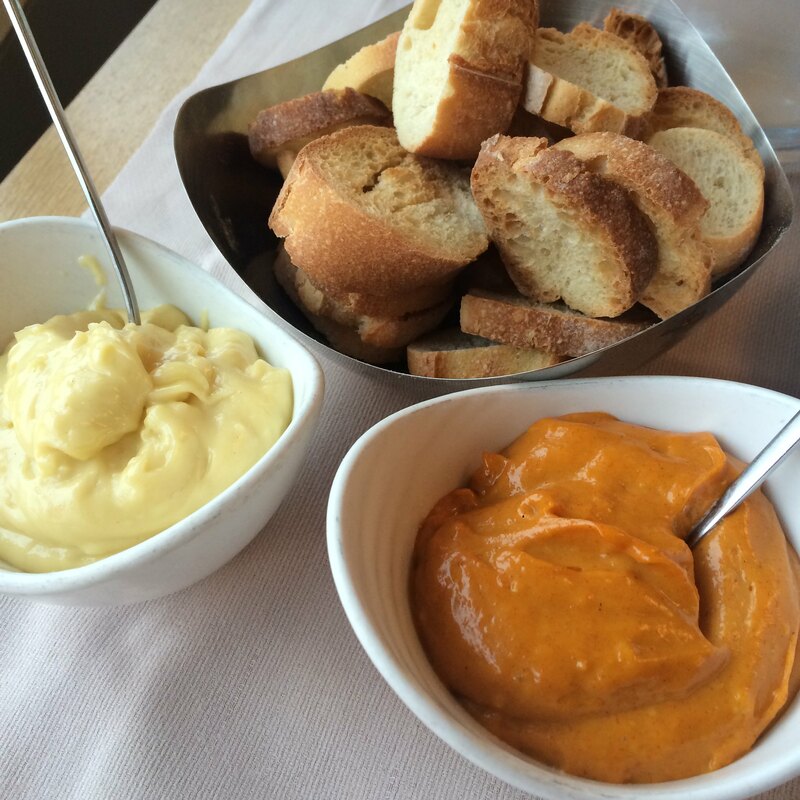 Aioli isn’t specific to Marseille, and in fact, Spain and Italy also feature it heavily in their cuisine too. However, in Marseille, the garlic and olive oil combination is much more similar to mayonnaise than it is elsewhere, as it includes egg yolk and lemon juice. I loved eating it on croutons with Bouillabaisse, but look out for a dish called Le Grand Aioli, which is boiled vegetables, poached fish and boiled eggs, served with aioli. Or, just grab a few jars to take home to enjoy with salads! Dark, bold and sticky, tapenade is a glorious spread made mostly of black olives, mixed with olive oil and sometimes capers. It’s so rich, you’re best off serving it as an appetiser with bread or croutons, but it’s also served with fish or as a stuffing for chicken. Like all many of these dishes, it uses local ingredients to show off the sun-kissed bounty of the Provencal countryside. Panisses are fried fingers or round discs of chickpea flour, sometimes served with sugar, but mostly served as a savoury appetiser or snack. Very similar to fried sticks of polenta, panisses are creamy on the inside, and crispy on the outside. Don’t be fooled by the humble ingredients – these are addictive and utterly delicious! I could eat an entire box of calissons all to myself – with a meaty texture like marizpan, they’re made with candied fruits to create a paste that’s topped with a thin, sweet, crispy layer of royal icing. They have a tropical flavour from oranges and melons, and are blended with almond flour to create a super-chewy texture. Although they’re most famously from Aix-en-Provence (hence the d’Aix part), you can find these in Marseille and they are delicious with a cup of coffee after a meal – and they make a great gift to bring back, too! 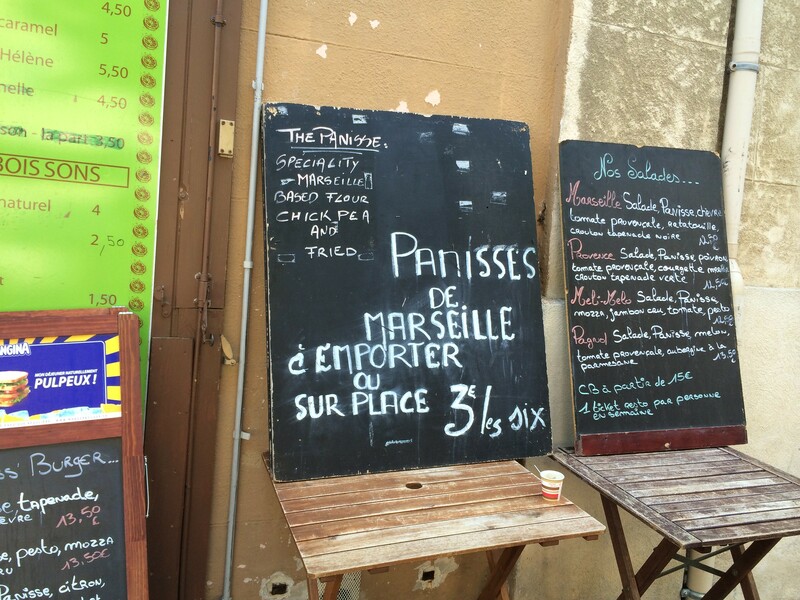 I hope you enjoyed my little culinary tour of Marseille! 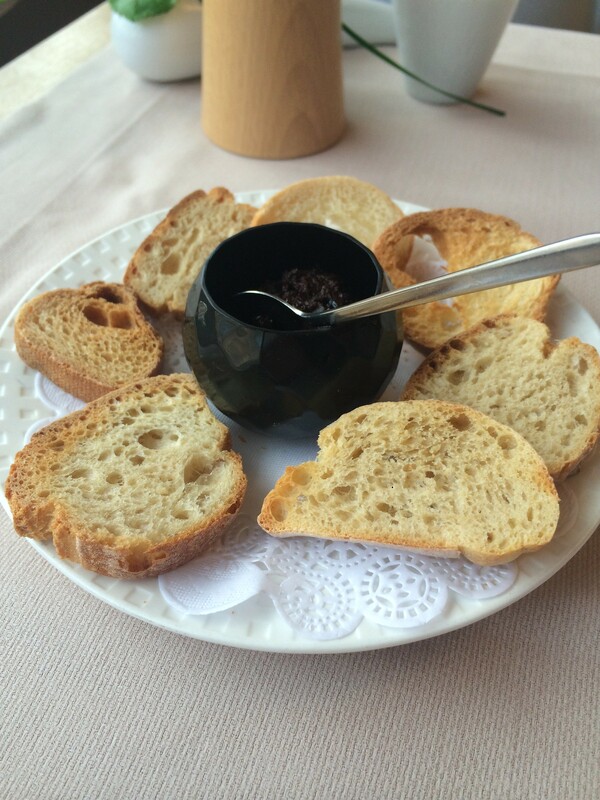 Despite my lengthy discussion of my favourite dishes, there are still loads I’ve missed out, including herbes de Provence, fougasse, daube provençale and more – so I hope you’ll be inspired to visit the area for yourself and discover something new! How beautiful and the food looks delicious! Yum!